Paleontologists at the American Museum of Natural History in New York, where the fossil on loan from China has gone on display, believe the skeleton of a young dinosaur covered with primitive fluff is proof that the creatures developed feathers for warmth, not flight, and that birds evolved from dinosaurs. 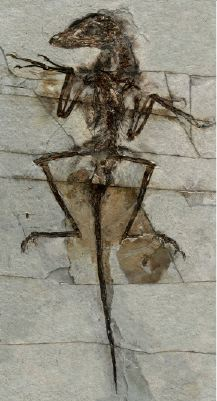 Mark Norell, chairman of the division of paleontology, said in a telephone interview that the fossil was about the size of a duck with a long tail. "It shows us that these creatures looked more like weird birds than giant lizards," he said. The 2.5 foot long fossil, described in the journal Nature, was found by farmers in layers of volcanic and sedimentary rock of the Yixian Formation in China's northeastern Liaoning Province. It is a dromaeosaur - a small, fast-running carnivorous dinosaur with a sickle-like claw on its middle toe. The creature is related to the mighty Tyrannosaurus rex and belongs to a group of dinosaurs called theropods - two-legged predators with sharp teeth. Feathers have been found on dinosaurs which could not fly and which "pre-dated the origins of birds and avian flight," the article in Nature said. Norell said the most reasonable explanation for the feathers was not flight but warmth. "It's conceivable that smaller dinosaurs like this one and even the young of larger species like Tyrannosaurus rex may have needed feathers to keep warm," he said. Until now most of the fossils of feathered dinosaurs, which were first discovered in 1995, have been incomplete. Scientists opposed to the theory that birds evolved from dinosaurs argued that the partial remains of the fluffy prehistoric creatures were not sufficient enough proof for the hypothesis. They believe birds evolved independently from a still undiscovered reptile. Ji Qiang, of the Chinese Academy of Geological Science which lent the fossil to the New York museum, said the discovery was particularly important because it showed the feathers were attached to the dinosaur's body. An exquisitely complete feathered dinosaur has emerged from the famed fossil beds of northeastern China's Liaoning Province. The new discovery, announced today in the journal Nature, gives further weight to the argument that birds evolved from dinosaurs and provides the strongest evidence yet that feathers pre-date the origin of flight. Earlier finds from Liaoning had hinted at the presence of featherlike structures on several dinosaur specimens, but critics charged that the structures were instead fibers of the protein collagen or that the fossils represented not dinosaurs but flightless birds. Opponents of the bird-dinosaur connection also noted that no feathers were known from dromeosaurs-a group of small- to medium-size theropod dinosaurs that exhibit numerous traits in common with birds and are therefore widely held to be their closest relatives. The new fossil, however, appears to answer both of those arguments. Paleontologist Mark Norell of the American Museum of Natural History in New York City and his colleagues report that the 130-million-year-old specimen represents a dromeosaur covered with filamentous structures that exhibit a branching pattern unique to feathers. The presence of featherlike structures on such a creature indicates that feathers must have evolved for some purpose other than flight-perhaps to help the animal keep warm. Indeed, for modern birds, which are warm-blooded, feathers provide critical insulation. Thus, Norell says, non-avian dinosaurs may have developed primitive feathers as they developed warm-bloodedness.